If you don’t find what you need at our store, we hope you’ll find it in another Bay Area reuse store. We’re very proud of the “co-opetition” in our area – other Bay Area businesses that make up a strong and growing reuse economy. Since our mission is to end the age of waste, businesses that would normally be thought of as competition become co-operators in a larger purpose. 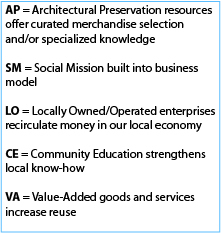 In addition to creating a viable marketplace for used goods, we think these enterprises add a little extra value. Let us know of your favorite local reuse stores in the comments section below. We’ll update this list periodically. Used building materials & factory closeouts. Architectural salvage specializing in Victorian through 1950s products. Antique and reproduction sinks, basins, faucets, tubs, and more. Offers repair service as well. San Francisco resource for reusable, recycled and remanufactured building and landscaping materials. Non-profit conducts a variety of classes, workshops, and tours. Home to a 2nd enterprise called Red Shovel Glass Company that produces tumbled broken glass and ceramics for decorative landscaping. Building materials and furniture, specializing in wood products. Design and build services for commercial interiors and household furnishings from reclaimed materials. Materials suitable for art, education and household use. More info on The Depot’s extensive community education activities on their website. Building materials, deconstruction services, and training/consulting. Retail business selling a little bit of everything reusable. Maselli and Sons Hardware in Petaluma has over 5 acres of steel salvage and all sorts of stuff that is super organized, all kinds of salvage here, and they have a full hardware store as well..its in Petaluma 519 Lakeville st., Its my go to salvage resource for art projects and design..
What about near Los Angeles? There’s nothing quite like us in LA, but a quick Google search for “architectural salvage”, “reused building materials”, etc… should yield many good results! feel free to email us with requests we regularly get a lot of “junk” that can be reused. If you have extra “junk” to get rid of…. please email us at info@urbanore.com and we can help you try and deal with it!! !